Ten years after the creation of the aluminium group Charles and Ray Eames developed the Vitra EA 219 as part of the so-called Soft Pad Group. A further development of the classic aluminium chair, the Eames supplemented the original design with leather cushioning. 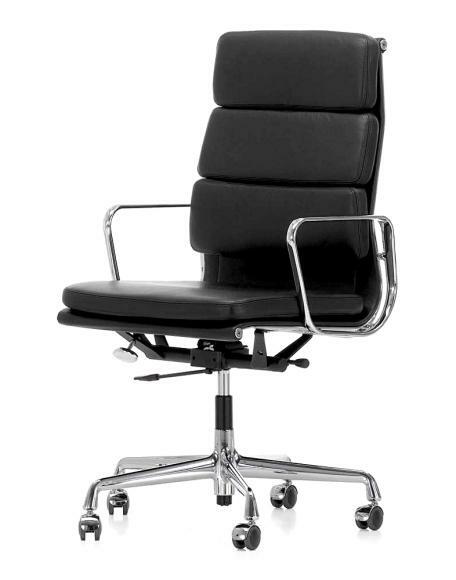 These ensure on the one hand extra comfort, and on the other increase the representative appearance of these most luxurious of chairs - yet without detracting from the elegance of the Eames Aluminium Chair. On request available without armrests. Does the EA 219 come with a warranty from the manufacturer? 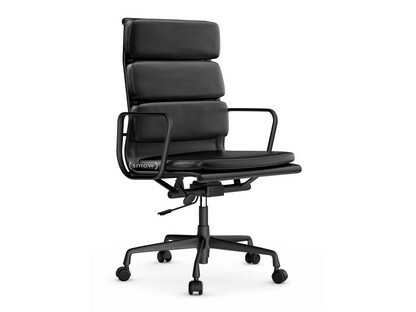 How much weight can an Eames EA 219 support? Ten years after the launch of the Eames Aluminium Chairs Ray and Charles Eames developed the series further in the form of the Soft Pad Group: the designers enhancing the familiar shape of the slim aluminium chairs with leather upholstery. 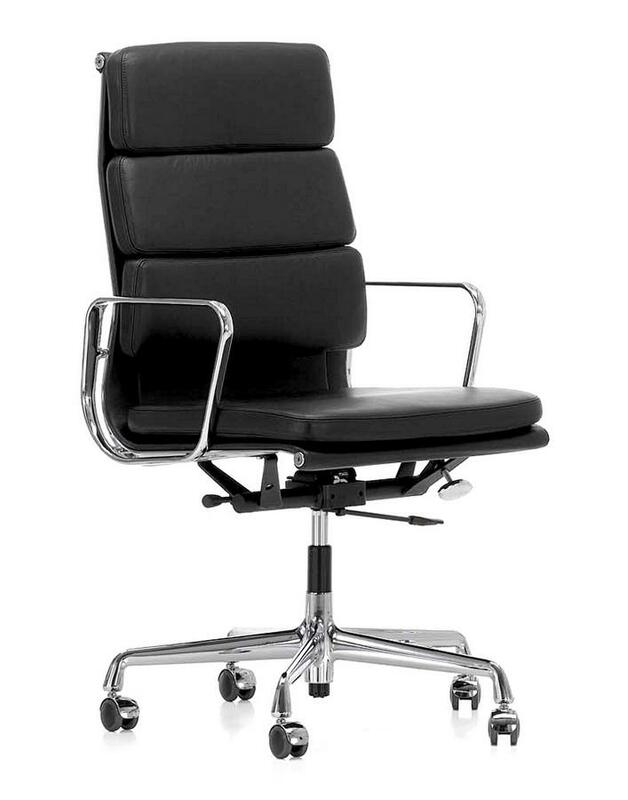 The leather upholstery bestows these Eames office chair with added comfort, yet without reducing the elegant look of the Vitra chairs. To the typical stretched membrane of the aluminium chair leather pads have been sewn - one on the seat, three on the back. Overall, the appearance of the Eames Soft Pad Chairs is more structured than the the Eames aluminium chairs and therefore allows a more representative, yet unobtrusive aesthetic. 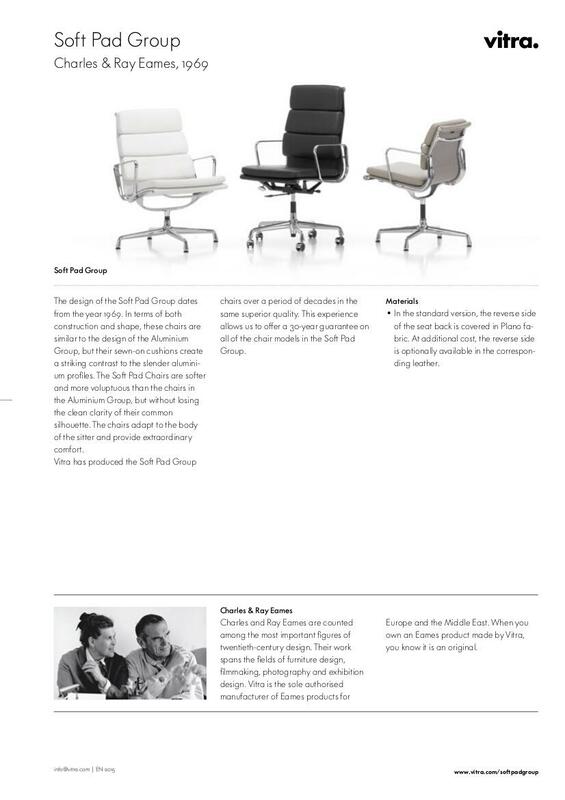 A combination which in many ways also defines the special character of the Eames Lounge Chair. 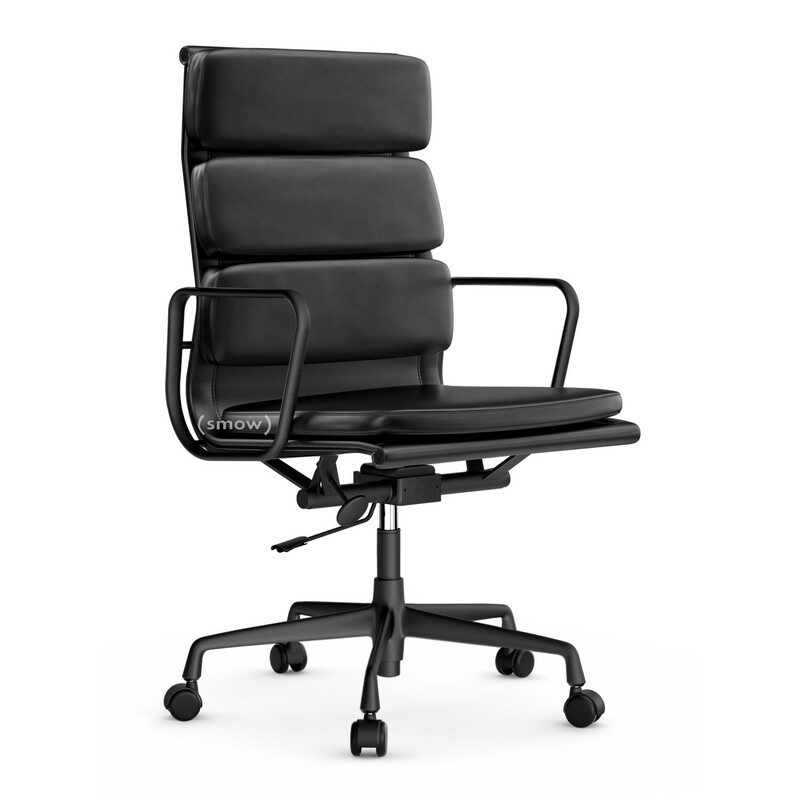 The Vitra EA 219 has a five-star base with castors and is height adjustable via a pneumatic spring. 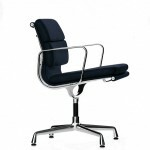 With its high back the EA 219 Soft Pad Chair is clearly the most dominant of this particular Eames chair series. The production of the Eames Soft Pad Group in Europe is undertaken by Vitra. The company, based in Birsfelden Switzerland and the Weil am Rhein Germany, possesses the exclusive licenses for the manufacture of Eames designs for Europe. 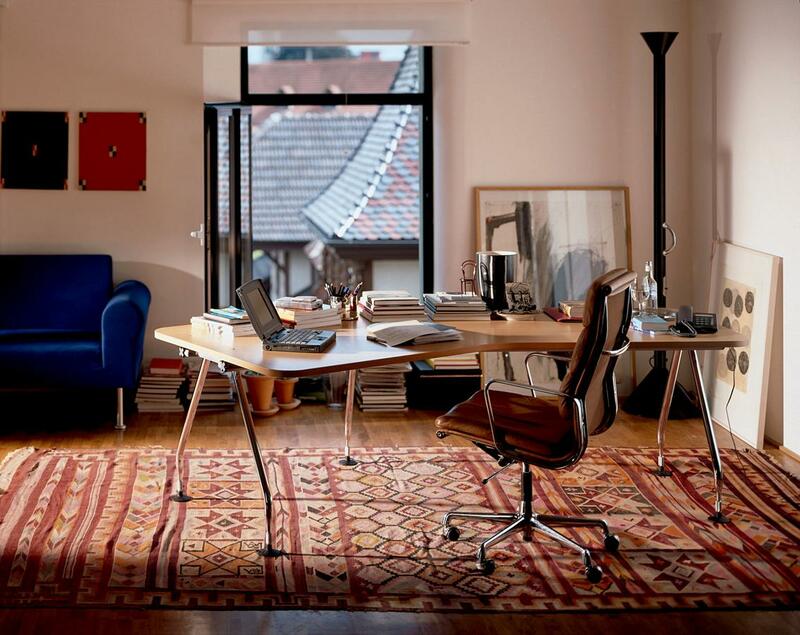 The soft pad chairs were launched in the USA by Herman Miller in 1969 and have been part of the Vitra range since the same year. The side sections, flexible metal elements, armrests and feet from Vitra EA 219 are made of die-cast aluminium, which is available either chrome plated or polished. Aluminium with its combination of high load capacity, light weight and good formability is the ideal material for the reduced, ergonomic Eames chair design. All Vitra Eames soft pad chairs come with a 30-year warranty: a promise of quality behind that stands behind Vitra's experience in the manufacturing of Charles and Ray Eames timeless and durable furniture designs. 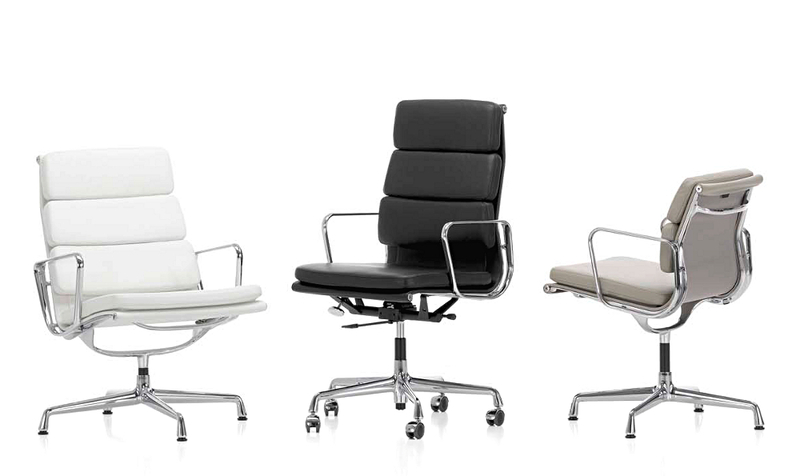 The EA 219 soft pad chair and the other Eames designs have been manufactured since 1957 under license by Vitra. Based in Birsfelden, Switzerland Vitra possess the exclusive rights to manufacture Eames design in Europe and the Middle East. Fittingly, as the history of Vitra effectively begins with an Eames chair: on a trip to New York in 1953 company founder Willi Fehlbaum spotted an Eames chair in a shop window and set about acquiring production licences. In addition, the design philosophy of Charles and Ray Eames continues to significantly influence the values and direction of the company. As an expression of the close cooperation between Eames and Vitra the estate of the designers passed into the possession of Vitra upon Ray Eames death; an archive which now serves as the basis for regular exhibitions on Charles and Ray Eames design canon. In addition to producing furniture design classics by designers such as Verner Panton, Jean Prouvé and of course Charles & Ray Eames Vitra are also responsible for the success of young, contemporary designers like Ronan & Erwan Bouroullec, Hella Jongerius or Antonio Citterio. 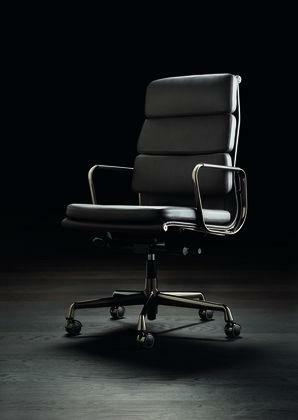 The Vitra EA 219 was designed byCharles and Ray Eames. Charles Eames was born in 1907 in St. Louis, Missouri and studied architecture at Washington University. Bernice Ray Kaiser was born in Sacramento, California in 1912 and studied art in New York under the German abstractionist Hans Hofmann. The two met in 1940 at the Cranbrook Academy of Art when Ray worked as an assistant for Charles Eames and Eero Saarinen. In 1941 the pair married and moved to Los Angeles where they established their Eames Studio, the source of innumerate furniture design, architecture, interior design, exhibition design, film and photography projects. 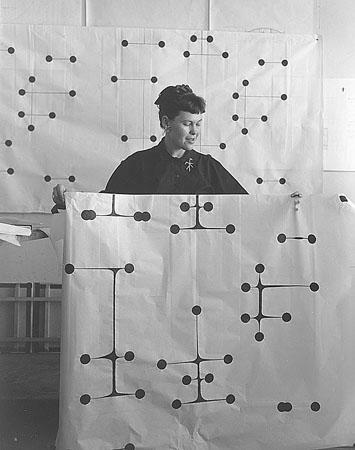 Although the oeuvre of Charles and Ray Eames is often largely considered the work of Charles Eames, Ray Eames' contribution was every bit as important and defining. The 1960s in Europe and America are largely considered a period of economic miracle. General prosperity led to a pronounced consumer mentality and finally to a stage of commercial saturation, a situation delightfully reflected in the elegant design of Charles and Ray Eames 1969 soft pad chair collection. 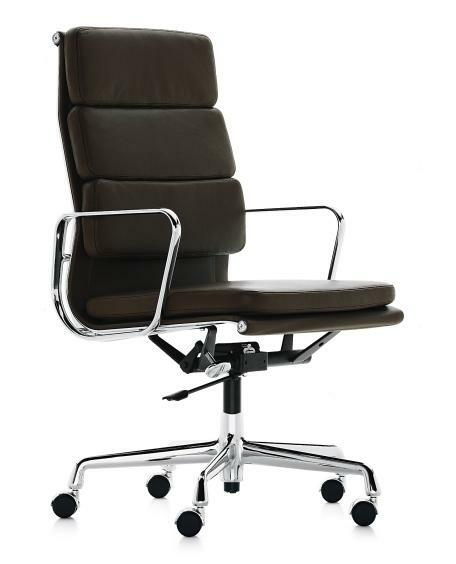 As a representative executive chair, the EA 219 not only fitted perfectly into the image of prosperous society but gifted it a stylish status symbol. But perhaps most importantly, the soft pad group stood in contrast to general movements in design of the period. With the new possibilities of the day, for all those offered by plastics, designers were increasingly undertaking formal experiments whose aim was not necessarily about creating well-proportioned "beautiful" objects, but often questioned traditional ideas and set out to break conventions. Charles and Ray Eames, however, remained ever faithful in their designs, and always created objects for their form - are not any current trend. 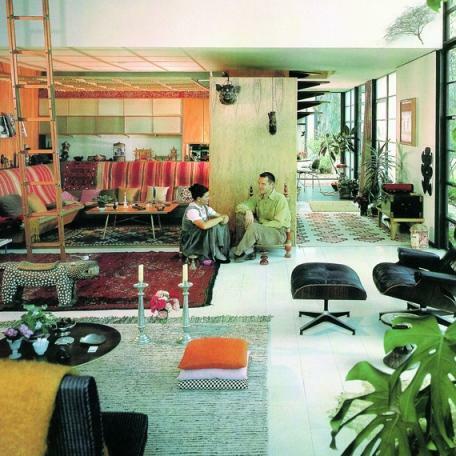 Charles and Ray Eames in their living room.